Chelsea Loft Residence. 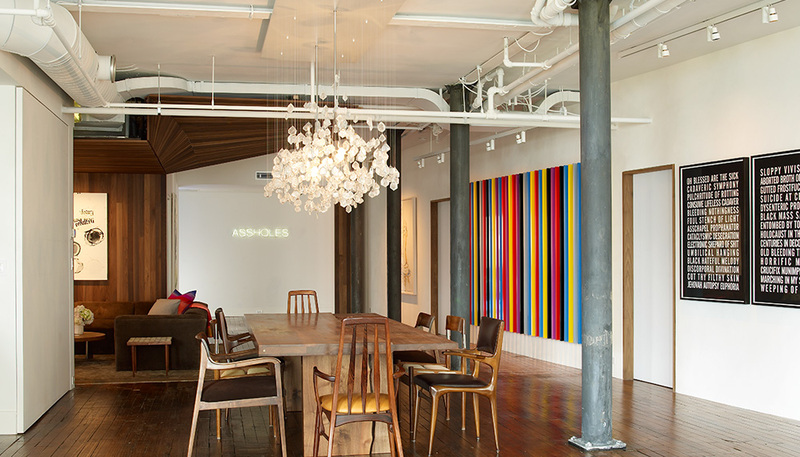 The main goal of this client, a single professional living in a stunning Chelsea loft, was to highlight his extensive collection of contemporary art. A palette of rich, neutral tones with one single accent color, a deep blue-green, was chosen to give the artwork center stage. Jarlath’s well-curated arrangement of vintage and contemporary furniture, upholstered in men’s fashion fabrics, creates an elegant, masculine repose for this bachelor. • A JM original chandelier of individually hung rock crystals in a cloud-like form elegantly floats above the dining room table. Surrounding the table is an artful mismatch of mid-century chairs covered in various tones of natural leather. • Milo Baughman chairs were finished in pinstriped men’s suiting fabric for the bedroom seating. Jarlath also created a new slipcover for the client’s existing upholstered headboard using black glove leather. • While the color palette is minimal, the remarkable palette of textures—linen, felted wool, concrete, fashion leather, and the Rosewood frame and leather of the Eames chairs, all set against the original hardwood floors—add a strong, but subtle impact to the living room.